Entries are now open for the first edition of the Corian® Design Awards 2019 organised by CASF Australia. The Corian® Design Awards has proven to be a successful platform for all design practitioners to showcase their creative use of Corian® in their projects. Open to specifiers, architects, kitchen and bathroom designers, and students among others from the Australian design community, the Corian® Design Awards is held in four stages over the year with two winners selected from the entries (one each from Residential and Commercial categories) at the end of each quarter (March, June, September and December). All the shortlisted entries go into the end-of-year pool, from where an overall winner in each category will be selected. The overall winners will be selected by an independent judging panel assembled by CASF and will be announced in January 2020. The winners will also receive additional editorial and global exposure via the DuPont Network as well as a trip to Milan in 2020. 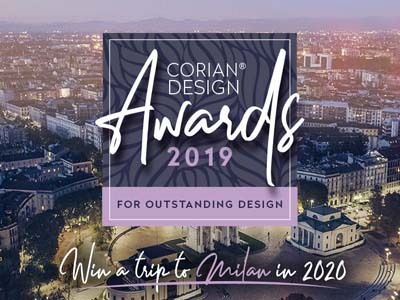 Entries for the 1st edition of Corian® Design Awards 2019 will close on 31st March, 2019.